Ella, now 10 yrs. old, is at Waldorf school in the 4th grade. She is a prolific reader and writer of fiction and poetry. Her favorite place to be is in the public library or in the woods. She is very knowledgable on birds, plants, trees and weather. She has found an absolute passion for the snow and tracks conditions and temperatures all around the globe watching for snowfall. She might wish or will Santa Barbara into a white winter some day of we don’t watch out! Ella is also playing the piano and the flute by ear and has just started the violin. Ella is focused on becoming a farmer some day and has taken a particular interest in fruit trees, chickens and milk goats. She works with a mentor farmer milking goats and is starting to learn the art of cheesmaking. 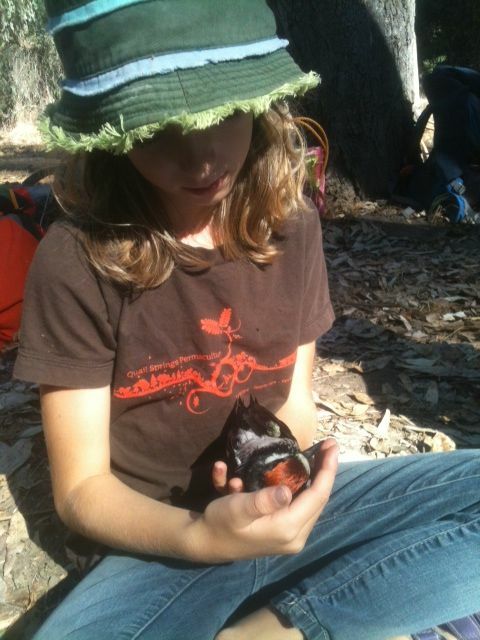 Ella is a beginning naturalist, it is joy to be in nature with her-I always learn something new.